Apple announced Thursday that its iTunes U educational service has now topped 1 billion content downloads since its launch in 2007. 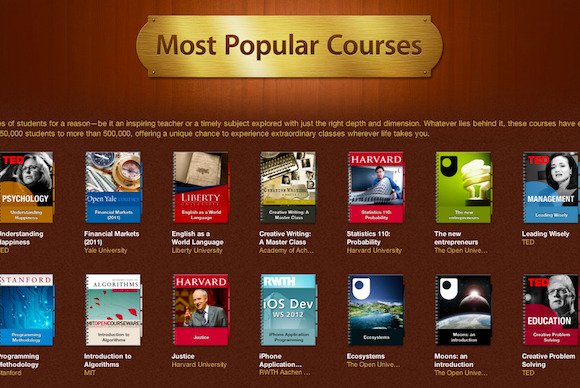 The service preceded the recent interest in “massive open online courses.” It provides lectures and other content from top-shelf schools, museums, and other institutions—often for free—giving other educators the tools to create their own curricula for iPhone, iPad, and iPod touch users around the world. The result? A lot of very impressive numbers. More than 1200 colleges and universities host courses online, as do more than 1200 K-12 schools. More than 2500 public courses are offered, Apple says, and “thousands” more are available through private channels. Duke, Yale, Cambridge, MIT, and Oxford have each enrolled more than 100,000 students in an iTunes U course; Stanford University and The Open University have each seen their content downloaded more than 60 million times. More than 60 percent of all iTunes U downloads take place outside the United States, Apple said on Thursday. iTunes U courses can be created in 30 countries—Brazil, South Korea, Turkey, and the United Arab Emirates were recently added to the list—and downloaded via the iTunes U iOS app in 155 countries. The iTunes Store is currently hosting a section of the service’s most popular courses to celebrate the 1 billion download benchmark. 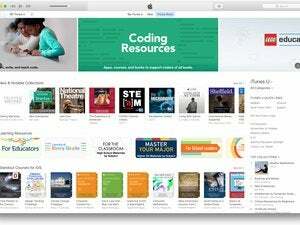 iTunes U has been part of the iTunes desktop application for the Mac and PC since its 2007 launch. iTunes U was launched as its own, separate iOS app in January 2012.